Poweradd Apple Watch magnetic charging cable features in well-made design with strong magnetic. 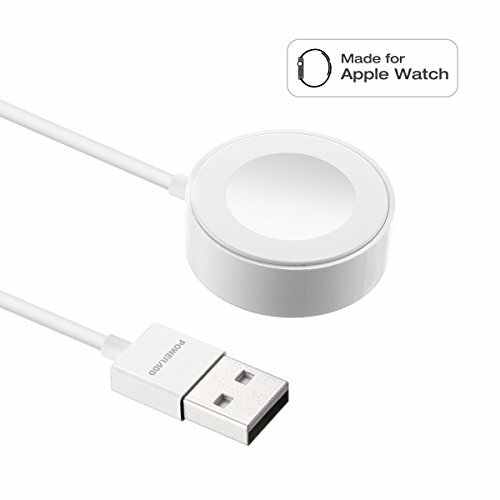 This Apple MFi certified Apple Watch charging cable is easy to magnet snap into place automatically and perfectly compatible with all Apple Watch models. This is a pocket-friendly compact charging cable for your Apple Watch with a 3.3 feet cord for easy charging. -Apple Watch Series1: Apple Watch, Apple Watch Sport, Apple Watch Edition. We provide 24 months limited product warranty and 24*7 friendly customer support for any purchase from Poweradd. Durable Magnetic Charging Dock -- With a good quality build, high temperature resistance and shock absorption. Strong magnetic adsorption function allows you to adjust the angle freely without deviating from the charger center. Apple Certified Cable -- Apple MFi Magnetic Charging Cable for Apple Watch, compatible with all Apple Watch models, 38mm and 42mm. Such as Apple Watch Series 1/2/3: Apple Watch, Apple Watch Sport, Apple Watch Edition, Apple Watch Nike+, Apple Watch Hermès, Apple Watch Edition and so on. Portable Apple Watch Durable Charging Cable -- Convenient to carry around with lightweight and compact design. If you have any questions about this product by POWERADD, contact us by completing and submitting the form below. If you are looking for a specif part number, please include it with your message.